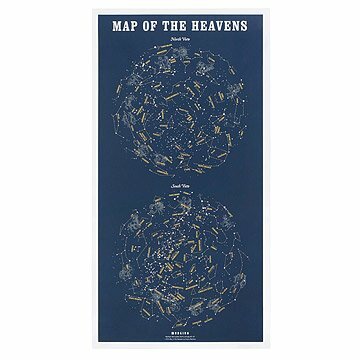 Take in the breathtaking beauty and complexity of the cosmos with this hand-silkscreened poster. Take in the breathtaking beauty and complexity of the cosmos without even stepping out the door with Jeremy Rendina's detailed screenprint. Using three inks, he brings various Northern Hemisphere constellations to life. After dark, glow-in-the-dark stars illuminate, displaying the night sky in spectacular detail just as if you were lying in the grass staring up at the real thing in all its majesty. Handmade in Ojai, California. Jeremy Rendina was born in New Orleans a Virgo and raised by his grandparents in Fremont, Ohio, a town whose main export is the sugar beet. He studied philosophy at the New School for Social Research. A deep love of nature is evident in his intricate work in film and printmaking. His handmade films have screened at such venues as the Harvard Film Archive and most recently at the Disney Red Cat. The poster is beautiful but, no matter the setting, even in a pitch black room without windows, none of the print was visible in the dark, though it is described as being "glow in the dark" with the use of the phosphorescent ink. I'll keep it because I like it well enough in daylight, and the quality of the print is high. I just wish I got what I paid for and what was described. This is a great looking poster on heavy, high quality paper. And it glows in the dark - what else could you want? Just a neat item - wish you all offered frames to go with the maps!